In the webinar, the sources of the discrepancy between measurements and simulation will be identified. We will demonstrate a first-time-right design flow of matching circuit using the FEKO electromagnetic solver and the Optenni Lab RF Design Automation Platform. 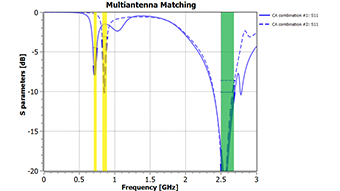 The most critical design areas are the accurate representation of the matching circuit layout, using realistic component models, correct calibration and reference plane in measurements and taking the radiation efficiency and multiantenna radiation patterns into account.